Renovated in 1975, this shopping area has been used as a model in other cities for urban renewal projects. The main complex is comprised of a South Building, central Quincy Market Building, and North Building. The central Quincy Market building houses restaurants, bars, and push-cart vendors with atrium-style enclosures on both sides. There is a sizable food court located under the impressive old dome in the center of the structure. The famous local pizza chain Pizzeria Regina is located on the Faneuil Hall side of Quincy Market, just to the left after entering through the granite columns. There are boutiques and shops in the buildings that surround the granite centerpiece. Upscale apparel shops and other high-end retailers occupy the street-level floor of the North and South Buildings. Exclusive hair salons and other specialized services occupy the higher stories. The famous Boston restaurant, Durgin Park, is located in the North building. 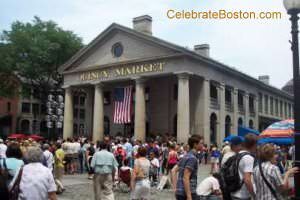 Faneuil Hall Marketplace is a great location to dine, shop, and people-watch. There are events in the complex, with artists and entertainers often at the Faneuil Hall end of the building. Historic Faneuil Hall itself hosts several retail shops on the first floor [currently closed for renovations]. The Marketplace is a bustling place, and an extremely popular tourist attraction. The original Quincy Market building was completed in 1826. It's a beautiful old granite structure that is 535 feet long. The style is Grecian-Doric with huge columns at each end. The building was built during Josiah Quincy's Mayoral term of 1823-1828, and was eventually named after him. Samuel Adams Drake quoted Mayor Quincy as saying the market: "invested the sluggish town with new life, and brought into practical use a new watchword, Progress." Those words were true in 1826, as well as in 1975. Walking Directions: Exit the station and walk north up Congress Street. Faneuil Hall will be visible on the right. The marketplace is just behind Faneuil Hall. From Government Center Station on the Green & Blue Lines, exit the station and walk straight ahead across the large brick plaza. Stay to the right of City Hall, Faneuil Hall and the marketplace are located across Congress Street.